Las Vegas • When coach Dave Rose introduced his BYU basketball team to the media in October, he laid out the chief goal for the 2017-18 season, his 13th at the helm: NCAA Tournament or bust. Tuesday night at Orleans Arena in front of 8,030 fans, most of them cheering for No. 6-ranked Gonzaga, the Cougars busted. 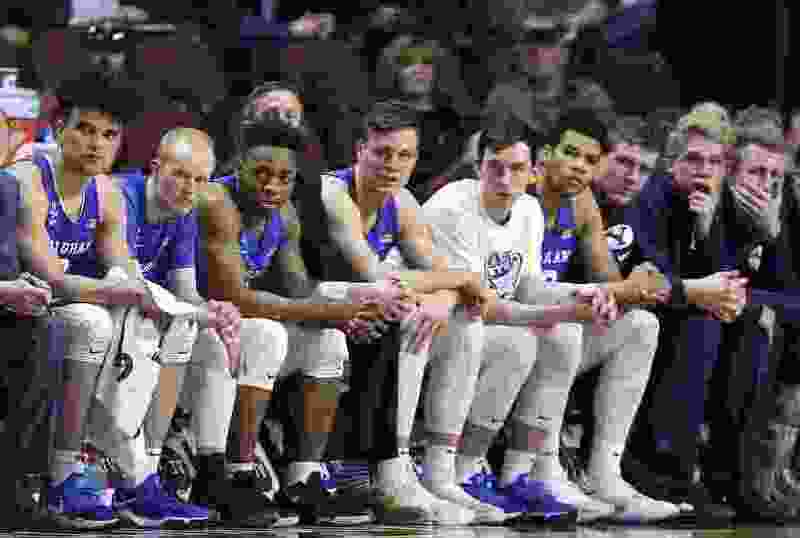 Knowing that a win over the Zags was the only way it was going to make the Big Dance for the first time since 2015, BYU was routed 74-54 in its third WCC final in five seasons. BYU’s loss was cheered by NCAA bubble teams everywhere, including Utah, Nebraska, Penn State and Saint Mary’s, because the Cougars were seen as a potential bid-stealer. In reality — given the Zags rarely lose at the WCC tournament — BYU’s NCAA hopes were dashed when it lost on the road at Pacific, San Diego and Loyola Marymount and at home to UT Arlington. So here the Cougars are, with a 24-10 record, an RPI of 67, a KenPom.com rating of 71 and a Jeff Sagarin rating of 68 as of Wednesday morning. They are more than likely bound for the National Invitation Tournament for the third straight year and fourth time in six years. Like almost everyone else who has challenged Gonzaga in the desert, they leave Las Vegas with frowns on their faces. The Zags are 23-2 in West Coast Conference tournament games here. “We are going to go home a little disappointed,” Rose acknowledged. Last year, the Cougars left town with a 22-11 record and an RPI of 65 before receiving a No. 3 seed in the NIT, so they are probably looking at a four or five seed when the selections are revealed Sunday night after the NCAA field is revealed. Top four seeds in each of the 32-team NIT’s four eight-team brackets host first-round games, as BYU did last year vs. UT Arlington. Rose was asked after the loss by someone apparently not paying attention to bracketology and all the other NCAA projections to make a case for BYU making the NCAA Tournament, but he noted there are “people assigned who try to figure out who those 68 teams are” and instead chose to talk about his own team. The Cougars set the NCAA goal in October knowing they would be without Eric Mika, whose decision to turn professional with two seasons of eligibility remaining “was unexpected,” Rose said last week. They did not know they would also be without their third-leading scorer from last season, Nick Emery, although they knew there was a chance because they acknowledged reporting some possible violations regarding Emery allegedly receiving improper benefits from a booster to the NCAA long before he withdrew from school two days before the season opener. Season-ending injuries suffered by big men Braiden Shaw and Ryan Andrus and Kajon Brown’s December departure for family reasons hurt their depth. A couple of sophomores who were expected to score more, TJ Haws and Zac Seljaas, had rough seasons in that department.